You can keep the cycle going as long as you want to, recycling the same original investment over and over. At any time you can use the in-store checks for regular purchases you would have made anyway, reducing the net investment to 0. I started doing this in July of 2013. I only bought products with rebates equaling their whole price, and I maxed out my quantity limit every time. In an 18 month period I acquired $4,064.59 in free products, used a small percentage of them, and sold some items at 2 garage sales at heavily reduced prices. My profit at the garage sales was $213.25. 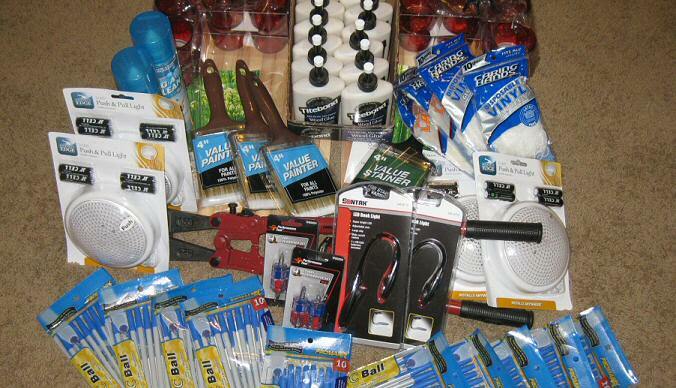 At the heavily reduced prices, I still have around $1000 in product to sell. Drive time/gas mileage. For me this is a non-issue because there are two stores I drive right past on a regular basis. I have never made a special trip to buy this stuff. Time needed to check ads, do the shopping, and fill out rebate forms. I spend 1-2 minutes checking the ads about once a week. Shopping can take between 10 and 30 minutes per trip, depending on how well you know the store. I mindlessly fill out the rebate forms on coffee break at work or while watching tv at home. Postage. I combine as many rounds of rebates as the mail-by dates allow, and in my first 18 months doing this I sent 13 envelopes for $6.37. Time and effort marketing the product. This what you make it, but if I had to pick one aspect of this that made it too much work for what it’s worth, this would be it. I’m going to try to solve this in the summer by going to a flea market and trying to liquidate the majority of my stockpile. Menards is a regional home improvement store that runs weekly and bi-monthly sale ads. At a given time, there are discounted sale items and items with mail-in rebates. A few of these rebates cover the entire purchase price, making the item free after rebate (FAR). The first step in the process is to keep updates on the current free items. Menards uploads their ad fliers on their website (link) about a day before the sale starts. Most of their sales end and begin on Sundays, meaning there are usually two or more sets of rebate items on those days. Occasionally Menards will run a “Crazy Days” sale beginning on a Thursday or Friday and running through that Sunday. Around holidays there are usually additional sales running, which may end or begin midweek. Several times a year the dreaded 12% sale comes around, where there are no FAR items on sale, and everything in the store has a 12% rebate. The good FAR items usually sell out at the stores in my area, so getting to the store on the first day of a sale cycle is helpful. This works well for me because I drive right by a store every Sunday around noon. If the item you’re looking for is out of stock on the shelf, look up to the inventory racks above the retail display. The last 4 or 5 digits of the SKU are written in marker on the unopened boxes of product. Many times the FAR items have run out on the display, but are still in stock up on the rack. Flag down an employee and they will happily retrieve the items for you. The Menards mail-in rebate system is extremely simple and user friendly compared to the manufacturer rebates you may have used before. There are no UPCs to remove, no complicated forms to fill out, and no need to copy receipts. A rebate receipt for each of your FAR items will print out at the bottom of your sales receipt. It has a bar code with info related to your purchase date, item ID, and quantity purchased. At the service counter there is an array of rebate slips in numerical order. Fill out the form on the back of each slip, put it in an envelope with the rebate receipt, and mail it in to the Menards rebate center. Multiple rebates can be mailed in the same envelope for the same address. I usually save up rebates until the earliest send-by date approaches, and send all I have in one envelope (saves on postage). A few weeks after you send in your rebate forms, you’ll receive an in-store check in the mail. This check can be used for any in-store Menards purchase, including FAR items. Since the check is treated as a discount at the register, and not a payment method, the total goes to $0.00 before sales tax is applied, so your check will be reduced by the actual sticker price of the taxable items. This means you can recycle the money over and over again, and you’re only paying sales tax on the original items you bought with cash! The checks do not expire. If you decide you are done accumulating free product, simply use the in-store rebate checks to buy everyday items you would have needed anyway. In the end, your pocketbook won’t even notice that you took out a “loan” from yourself to fund your “Menards account.” You’ve just paid yourself back and ended up with a huge pile of items, free and clear! This is the step where you can be as creative as you want. I haven’t been creative at all, and only tried to sell this stuff at 2 garage sales (yard sales, for non-Midwesterners?) over the last two summers. I have thought about putting a few items on amazon or craigslist. I plan to rent a stall at a flea market this spring or summer to liquidate a greater volume. Instead of filling out the rebate forms, you can put address stickers on the backs of the forms. This can cut down your time investment considerably. Sometimes the rebate center seems to get backed up and it will take 8 or more weeks to get a rebate check. It usually takes 3-4 weeks. Menards seems to be very lenient with the mail-by dates on the forms. I’ve screwed up and sent in a batch of rebate forms containing some up to 2 weeks past the final mailing date, and I’ve never been denied a rebate because of it. Keep copies or digital photos of all your rebate receipts and forms. I have successfully re-applied for a rebate that was somehow “lost in the cracks” by e-mailing copies of the originals. Rarely an item is available FAR with no quantity limit. Rarely items will have a rebate greater than the purchase price. You do indeed get a positive balance on the rebate: it works. 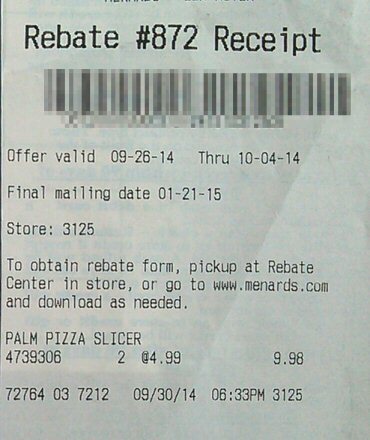 I love Menards and their fantastic rebates! They are quite generous, and almost every week they offer something free, or very near free, so long as they aren’t running one of their “11% off everything” or an “anything you can fit in the bag, 15% off” sales. Sometimes there are a half-dozen or more items eligible for FAR deals! 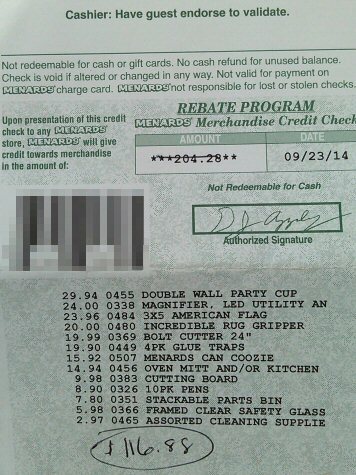 Yes, they do issue “merchandise credit checks” (not cash) and you must spend it at Menards. But since I shop there all the time, so this is a non-issue for me. It’s very easy to become a hoarder of certain items. I try to keep this in mind and apply some common sense, that is, I ask myself “will I really use this sometime?” Or, at the very least, “can my local Habitat for Humanity chapter use a couple of these?” I am not real skilled at selling stuff… I don’t hold rummage sales or sell through Craigslist… so some self-discipline is in order. Having said all that, Menards offers some pretty nice stuff on rebate, and has pretty much the easiest rebate-submitting system that I’ve ever run across. And as you noted, the turn around time is usually pretty good (around a month, barring the unforeseen occasional slowness). If only EVERY rebate was so easy to submit, and rapid to receive!! Also, as you mentioned, I have also had a rebate or two go missing over the years. I track them all carefully, so I know when something’s very overdue. The great news is, I have found their rebate clearinghouse’s email-based customer service to be quick, responsive, and helpful in resolving such issues. Your advice about keeping a photo or copy is spot-on. Nice article!! Long live Menards rebates!! Many other,stores used to do many free after rebate items suchnas rite aid and staples but theynstopped doing it many years ago….